The US Treasury has sold its remaining stake in Citigroup, in a deal which it says will make a $12bn (£7.6bn) profit on its overall investment. Citigroup was one of the worst victims of the financial crisis, and the US government stepped in with $45bn of bail-out cash in 2008 and 2009. The money was part of the $700bn Troubled Asset Relief Program (Tarp). On Monday, the government sold off its remaining shares in the bank for $4.35 (£2.75) each. "By selling all the remaining Citigroup shares today, we had an opportunity to lock in substantial profits for the taxpayer," said Tim Massad, acting assistant secretary for financial stability. "We have advanced our goals of recovering Tarp funds, protecting the taxpayer and getting the government out of the business of owning stakes in private companies," Mr. Massad said in a statement. The US government support for Citigroup led it to end up with a stake of 27% in the bank, although this has been gradually reduced over the past year. 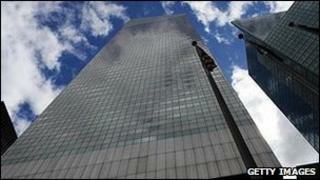 The bank repaid $20bn (£12.6bn) in December 2009. "Citi is pleased that the US Department of the Treasury has finalised plans to exit from its remaining holdings of Citi stock," said Citigroup spokesman Jon Diat. "We are very appreciative of the support provided by the Treasury during the financial crisis." The US government is in line for further earnings from Citi through the sale of warrants and preferred securities it holds. In parallel to Citi paying off its debts, carmaker General Motors is likewise shedding itself of government control. And the US Treasury is expected to begin selling off its stake in insurance giant AIG next year. It is now estimated that the cost of the Troubled Asset Relief Program will cost the US taxpayer $25bn, much less than earlier estimates.